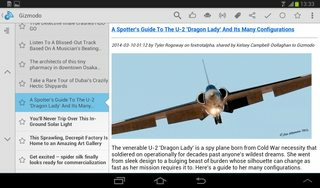 Now that Google Reader is being retired, what are my options for consuming RSS feeds on the web and synchronizing with my Android device? Social media sharing is not as important to me as being able to keep up with many disparate sites/feeds in a single place and for the data to be stored in the cloud. I'm aware of other very similar questions here, but they are old and most of the suggested alternatives have already themselves been shut down. It should go without saying that services that solely interface with Google Reader are not a viable option (unless they have a plan for viability after Reader gets shut down). Feedly syncs directly to Google Reader for now, and will migrate your feeds off google reader when the time comes. 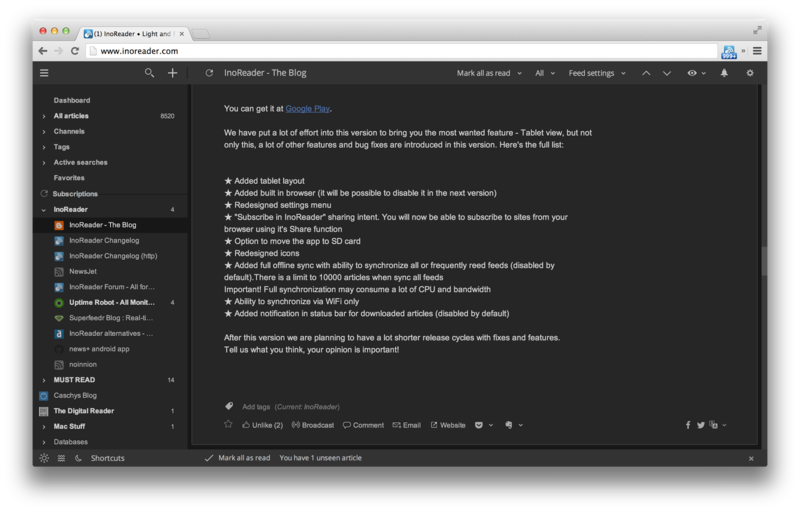 They have a post simplifying the transition from Google Reader to feedly. Feedly runs in the browser and on various mobile devices. 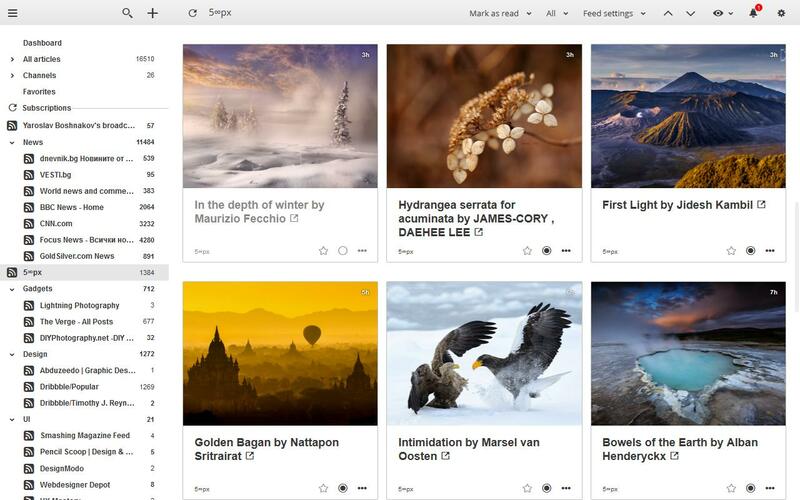 It supports categories for feeds like Google Reader. It supports j and k keyboard shortcuts for navigating between posts. A "tiled" view can be readily configured. Feedly - Probably the most popular alternative, syncs directly to Google Reader for now. Main downside is that using it on the web requires installing a browser plugin. 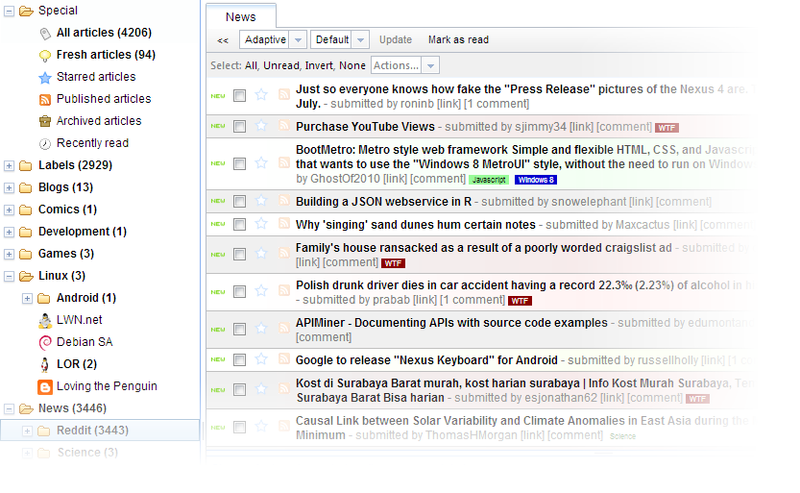 Netvibes - An RSS reader that also acts as a dashboard app (like iGoogle). Looks like an emphasis on social analytics for paid tiers, but the free level is fine for RSS reading (import Google Reader data instructions). Some generic instructions for exporting your feeds are available from the Data Liberation Front. 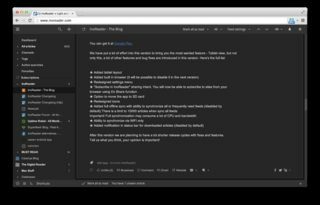 If you don't mind self-hosting it, or finding someone who will, Tiny Tiny RSS is a Free Software web application with a similar look and feel of GReader. It comes with a mobile web UI and there are 3rd party native apps that interface with it. I just found Old Reader which purports to be "like Google Reader was back when it was good". It can import OPML files from Google Reader, has the same keyboard shortcuts, and seems to work pretty similarly. I'm about to try it out, and will post back once I get some impressions of it. I really liked Fever but recently switched to Google Reader for the iPhone and iPad App Reeder. It is an app that you install on your own hosting - it costs $30. I've used Bloglines in the past, but always come back to GReader. I am surprised that no one has mentioned Calibre - an ebook management tool. It also has capabilities for downloading RSS feeds and converting them into epubs or another format of your choice. Calibre is available on android but I don't think is available on iOS. However, there are ways to get around it. Calibre can be left running as a background process that will auto-fetch the RSS feeds. The android app can directly sync from your 'machine'. If it's on the internet, just the URL of machine with authentication details (if any) should suffice. You could also read them "in" calibre too. For iOS, any app that allows you to download epubs or anything for viewing should work. However, you can just open up the browser, hit your calibre server (which will throw quite a good page) and you can browse and read/download what you want. It's pretty neat and I use it for all of my 'reading' related things. Another option is to use Flipboard - you can add any RSS to it and it'll automatically fetch it and you can read it quite conveniently across various phones/tablets. That's also something I'd strongly recommend. 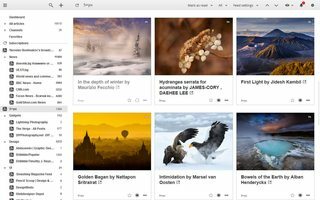 Another open source self-hosted alternative would be selfoss by Tobias Zeising. I've just set it up and it works well for my few feeds. With the end of Google Reader, activity seems to have shot up and you can import your feeds from Google Reader. Just an alternative idea, I don't know if can be useful for you. You can register all feeds you are interested on FriendFeed. And then you can set in the Notification Options to send you an instant email every new post. After Google Reader turned out the lights, I experimented with a long string or RSS readers and aggregation systems. I eventually settled on Feedly and tried to camp out there. While the interface is polished and it does most things well, after a couple weeks I was frustrated with how little customization could be done. Adding feeds from mobile was also a pain and there were other minor annoyances, so I went hunting again. 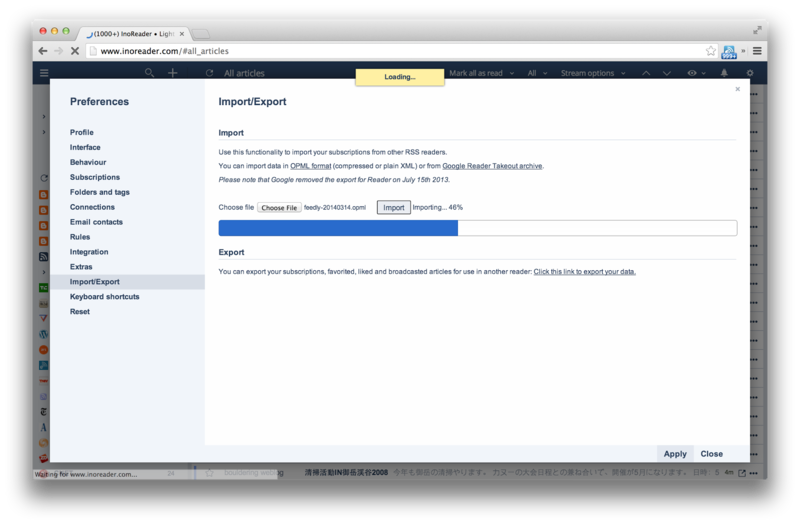 Eventually I dug up InoReader and have not looked back! I actually love the service. Not only does it sport feature parity with what Google Reader was, it allows a number of usage and interface customization out of the box that I used to turn to elaborate user-scripts for. It has a low key but highly functional interface that provides an efficient work flow for consuming feeds while staying out of your face both in browser and on mobile, integrates without being invasive and has never left me wishing "if only this did/had X". The service is free for most usage (although a paid version exists that allows you to do extras like search through ALL feeds they track, not just your subscribed ones) and you will not be bothered by any advertising. Their release blog is a good place to get a dime tour. It talks about new or revised features as they come out, but with a recent full makeover this will quickly give you an idea of what the whole system looks like. I'm experimenting with Pulse and am so far moderately impressed: The UI is a thing of beauty, but the user experience is quite different from Google Reader and importing your Reader feeds with the web version of the app is not possible. They claim to have a very simple import function to grab your Reader feeds in the mobile version though, which I haven't been able to try out yet. If you're looking for something close to the Google Reader experience, The Old Reader is the best I've found. I think the best strategy for now though is actually to keep using Google Reader for another couple of months and then migrate right before it sunsets. Google Reader's death is going to create a huge flurry of activity in the RSS feed reader space in the next few months. Hundreds of very smart people are this very moment working their asses off to make the world's best RSS feed reader and have it available before July 1, and it makes the most sense to me to give them the time to get their work online and make my decision then. Unlike ordinary RSS-readers, LikeHack adds links from your Facebook and Twitter feeds, and also provides two kinds of custom filters to eliminate whole topics by keywords and exclude instagram photos and other media from your feed. It makes also all links you shared searchable. We have launched recently and glad to invite you to test! I'm posting this as an answer just for future reference. Since I see people listing browser plugins here, too, I'll link to two alternatives, which basically rely on Google Reader. This doesn't answer my question, though. I'm still looking for web alternatives, probably unsuccessfully. Apparently Digg wants to rebuild the best of Google Reader's features (including its API). However, they are not there yet and many things are missing for now. It looks promising though. 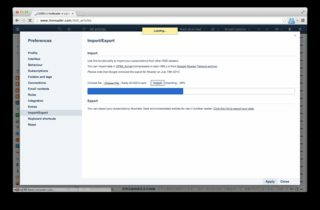 Yanobs Reader is a paid hosted Tiny Tiny RSS. Q-Sensei FeedBooster seems to be a great alternative. Not the answer you're looking for? Browse other questions tagged webapp-rec google-reader rss-reader or ask your own question. 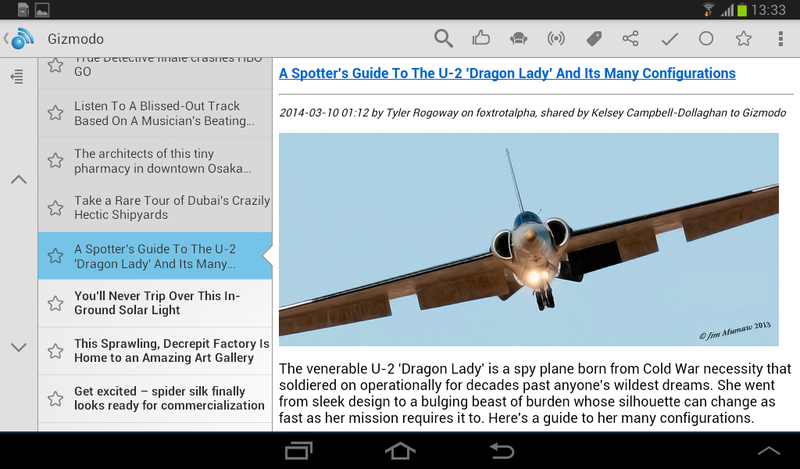 Are there other web alternatives of Google Reader? Addon to Google Reader for “popular posts”? How to update the feed check frequency with Google Reader? Where did my Google Reader bundle go? How to make Google Reader Play to only show unread items of Google Reader?